220 pages | 50 B/W Illus. 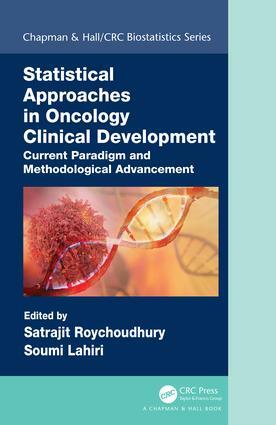 Statistical Approaches in Oncology Clinical Development : Current Paradigm and Methodological Advancement presents an overview of statistical considerations in oncology clinical trials, both early and late phase of development. It illustrates how novel statistical methods can enrich the design and analysis of modern oncology trials. The authors include many relevant real life examples from the pharmaceutical industry and academia based on their first-hand experience. Along with relevant references, the book highlights current regulatory views. The book covers all aspects of cancer clinical trial starting from early phase development. The early part of the book covers novel phase I dose escalation design, exposure response analysis, and innovative phase II design. This includes early development strategy for cancer immunotherapy trials. The contributors also emphasized the role of biomarker and modern era of precision medicine. The second part focuses on the late stage development. This includes the application of adaptive design, safety analysis, and quality of life (QoL) data analysis. The final part discusses current regulatory perspective and challenges. Covers a wide spectrum of topics related to real-life statistical challenges in oncology clinical trials. Provides a comprehensive overview of novel statistical methods to improve trial design and statistical analysis. Detailed case studies illustrate the real life applications. Satrajit Roychoudhury is a Senior Director and a member of the Statistical Research and Innovation group in Pfizer Inc. Prior to joining; he was a member of Statistical Methodology and consulting group in Novartis. He has 11 years of extensive experience in working with different phases of clinical trial. His area of research includes early phase oncology trials, survival analysis, model informed drug development, and use of Bayesian methods in clinical trials. He is industry co-chair for the ASA Biopharmaceutical Section Regulatory-Industry Workshop and has provided statistical training in major conferences including the Joint Statistical Meetings, ASA Biopharmaceutical Section Regulatory-Industry Workshop, and ICSA Applied Statistics Symposium. Soumi Lahiri has 12 years of extensive experience in working different therapeutic areas. She is the former Director of Biostatistics in Clinical Oncology, GlaxoSmithKline. She has also worked in the oncology division of Novartis Pharmaceutical Company for two years. She is an active member of the ASA Biopharmaceutical section and former chair of the membership committee.